VANCOUVER, CANADA – Kaizen Discovery Inc. (TSXV: KZD) is pleased to report that significant copper-gold mineralization has been intersected in the first hole drilled by Kaizen at the Aspen Grove Project's Ketchan prospect (see location map below). The Aspen Grove Project covers 11,237 hectares in southern British Columbia's premier copper porphyry belt, part way between the Copper Mountain and Highland Valley mines. Kaizen owns 60% of Aspen Grove, with Kaizen's strategic partner, ITOCHU Corporation of Japan, owning a 40% interest. Exploration at the Aspen Grove Project is being funded by C$4 million in dedicated financing for the project provided by ITOCHU in 2014. Approximately 7,000 metres of drilling is planned for 2015, with Kaizen as the project operator. The initial drill hole at Ketchan, K15-01, tested a magnetic and chargeability high near the southwestern margin of the Ketchan porphyry. The hole was drilled to a depth of 390 metres, and intersected a 265.5-metre thick zone of copper-gold mineralization, starting at surface. The intersection included a 78-metre interval grading 0.50% copper and 0.15 grams per tonne (g/t) gold. Table 1: Assay results for drill hole K15-01, July 2015. Note: The true width of the drill intersections reported throughout this release is unknown as the geometry of the mineralized zone is not yet known. The upper part of the mineralized zone (to a depth of approximately 170 metres) consists of strong magnetite-K-feldspar (potassic) and epidote alteration, veining in diorite porphyry, and intrusive and hydrothermal breccia. Chalcopyrite (copper mineralization) occurs in magnetite and chalcopyrite-pyrite veins and as disseminations. Below 201 metres, the higher-grade chalcopyrite mineralization occurs mainly in hydrothermal breccia with remnant potassic alteration overprinted by intense epidote, chlorite, sulphide stringers and disseminations. The highest copper grades occur in the deepest part of the intersection, which from 248 to 262 metres returned 1.03% copper and 0.13 g/t gold over 14 metres. This interval also returned 126 ppm (parts per million) molybdenum. "We are very encouraged that our first drill hole at the Ketchan prospect has yielded significant copper-gold mineralization over a lengthy interval," said B. Matthew Hornor, President and CEO. "We plan to undertake step-out drilling from this intercept later in the summer after completing the rest of our planned initial 10 exploration holes at Aspen Grove." *Source: Copper Mountain Mining Corporation and Teck Resources Q1 2015 production results. Map: Location of the Ketchan and Par prospects at Kaizen's Aspen Grove Project. The second drill hole in the Ketchan program, K15-02b, was collared 255 metres east of K15-01 and tested a second magnetic and chargeability high near the southwestern margin of the Ketchan diorite. K15-02b was completed at 485 metres after intersecting the contact between the diorite and Nicola Group marine sedimentary rocks at 401 metres. A 386-metre thick zone of copper-gold mineralization was intersected. Table 2: Assay results for drill hole K15-02b, July 2015. Higher grade mineralization between 57 and 129 metres is marginal to the magnetic high and is associated with multi-stage texturally destructive alteration including early potassic and later epidote, chlorite, actinolite, albite and chalcopyrite. Higher gold values (up to 1.81 g/t over a single 2-metre sample width) in the lower zone occur at depth beneath the magnetic high. Exploration at Ketchan is continuing with 150- to 250-metre spaced drill holes, designed to test the entire 300-to-500 by 1,800-metre-long mineralized system as defined by airborne magnetics, geological mapping and rock sampling, and induced polarization surveys. Follow-up drilling is expected once the initial program is complete. Photo: Mineralized copper drill core from Ketchan prospect. 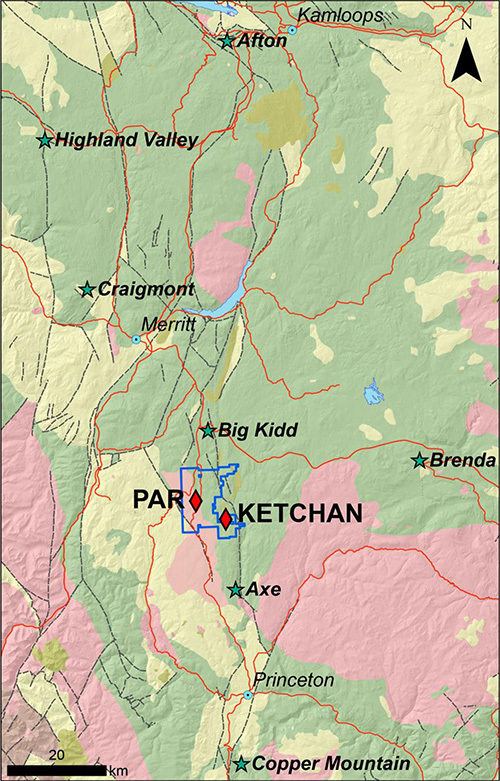 The Par prospect west of Ketchan contains a central chargeability and magnetic high not tested by Kaizen's 2014 drill program. This anomaly was tested by drill hole AG15-01, which intersected over 100 metres of mineralized breccia from surface before being completed at a depth of 459 metres. Table 3: Assay results for drill hole AG15-01, July 2015. Mineralization consists of polyphase magnetite-hematite-pyrite-chalcopyrite stockwork veining and disseminated sulphides in a hydrothermal breccia which cuts chlorite-silica altered microdiorite porphyry. The porphyry intrudes a thick sequence of intensely phyllic altered, silicified quartz-feldspar porphyry and volcanics containing widespread quartz-pyrite-molybdenite veins and minor disseminated sphalerite. Table 4: Azimuth and dip of Ketchan and Par prospect drill holes. Drilling also has been initiated at the Tanzilla Project near Dease Lake, in northwestern BC. Approximately 1,800 metres of drilling is planned to test deep porphyry potential of the Silica Ridge and Gopher Zone targets in 2015. The Tanzilla program is being funded under an Earn-in Agreement by Freeport-McMoRan Corporation of Canada Limited, a wholly owned, indirect subsidiary of Freeport-McMoRan Copper & Gold Inc. Freeport can earn an initial 51% interest by funding cumulative expenditures of C$8 million over a four-year period. Kaizen is the operator under the agreement for the 2015 program. Kaizen's disclosure of a technical or scientific nature in this news release has been reviewed and approved by John Bradford, M.Sc., P.Geo. a geological consultant for Kaizen, who serves as a Qualified Person as defined under National Instrument 43-101. Mr. Bradford is not independent of Kaizen for purposes of NI 43-101. 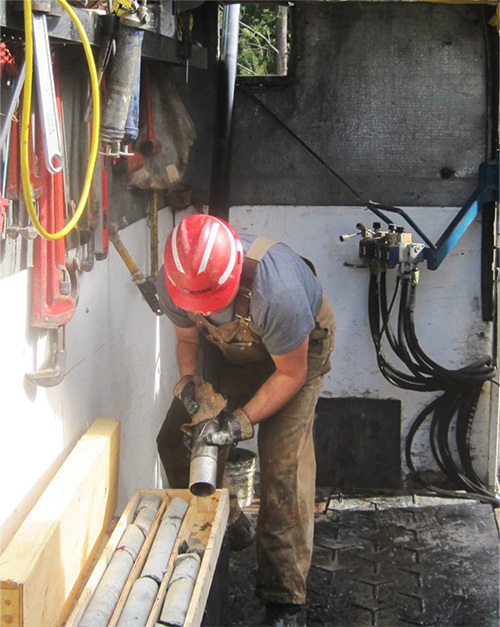 Drill-core samples (2-metre sample length) for the Aspen Grove Project were prepared at Kaizen's core logging facility in Merritt, BC, and samples were shipped to ALS Minerals' preparation lab in Kamloops, BC. Ketchan samples were analyzed at ALS's ISO 9001:2008-certified North Vancouver laboratory for gold, platinum and palladium by fire assay and ICP-AES, and for 35 elements, including copper, molybdenum and silver, by ICP-AES using an aqua regia digestion. Par samples were analyzed at ALS's ISO 9001:2008-certified North Vancouver laboratory for gold by fire assay and ICP-AES, and for 35 elements, including copper, molybdenum and silver, by ICP-AES using a four acid digestion. Core intervals cited above represent apparent, not true widths; true widths are not known. Assay intervals above have been calculated with no cutoff value. Blanks, standards and duplicate samples were inserted into the sample sequence with a ratio of approximately one sample out of 15. The 2015 drilling program and sampling protocol is supervised by Nils Peterson, M.Sc, P.Geo, a geological consultant for Kaizen, and by John Bradford, M.Sc., P.Geo. Mr. Bradford has verified the data disclosed in this news release. Statements in this news release that are forward-looking statements are subject to various risks and uncertainties concerning the specific factors disclosed here and elsewhere in Kaizen's periodic filings with Canadian securities regulators. When used in this news release, words such as "will, could, plan, estimate, expect, intend, may, potential, should," and similar expressions, are forward-looking statements. Forward-looking statements may include, without limitation, statements regarding Kaizen's plan to drill 7,000 metres at the Aspen Grove Project in 2015; statements regarding Kaizen's plan to undertake step-out drilling from the drill hole K15-01 intercept later in the summer after completing the planned initial 10 exploration holes at Aspen Grove; statements regarding Kaizen's plan to drill approximately 1,800 metres of drilling at the Tanzilla Project in 2015 to test deep porphyry potential of the Silica Ridge and Gopher Zone targets. Although Kaizen has attempted to identify important factors that could cause actual results, performance or achievements to differ materially from those contained in the forward-looking statements, there can be other factors that cause results, performance or achievements not to be as anticipated, estimated or intended, including, but not limited to, equipment failure, the failure of exploration programs or studies to deliver anticipated results or results that would justify and support continued exploration, studies, development or future operations, and local opposition to exploration activities. There can be no assurance that such information will prove to be accurate or that management's expectations or estimates of future developments, circumstances or results will materialize. As a result of these risks and uncertainties, the results or events predicted in these forward-looking statements may differ materially from actual results or events. Accordingly, readers should not place undue reliance on forward-looking statements. The forward-looking statements in this news release are made as of the date of this release. Kaizen disclaims any intention or obligation to update or revise such information, except as required by applicable law, and Kaizen does not assume any liability for disclosure relating to any other company mentioned herein.